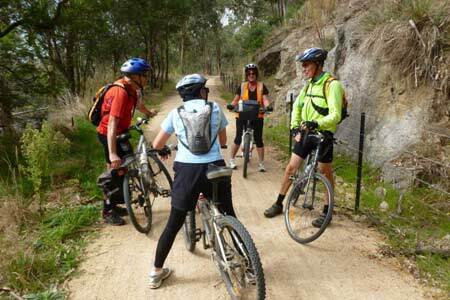 Eight intrepid explorers rode the 40 km between Yea and Tallarook on a beautiful autumn Saturday. Most were sensible and organised a car shuffle for a one-way trip. Two decided that things always look different going the other way, so they clocked up 80 km on an out-and-back trip. Ten rode the trail between Alexandra and Yea on a grey Sunday. The old addage “build it and they will come” certainly seems to hold true here. We met all sorts of day trippers and touring cyclists on both days. The Yea caravan park featured bikes on quite a few cabin verandahs and lined up beside tents. What can we say? There’s a bit of “polishing” left to do and some recent rain damage to repair, but we all loved it. The countryside is varied, the vistas are spectacular, and the scones, muffins and toasted sandwiches we consumed at various trail-side cafes were delicious. Now we want a long-distance trail even more! 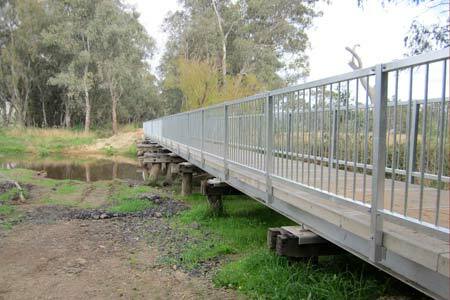 Plans are already underway for a trip to explore another rail trail, probably the High Country Rail Trail as soon as the spectacular 660m bridge over Sandy Creek is complete. mixed in with old railway ballast nearby.